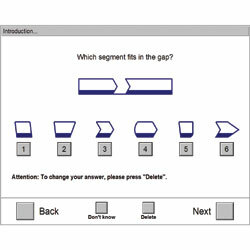 Visualization, as it is assessed in this test, is an aspect of intellectual capacity providing the psychologist with essential information about the respondent which cannot be assessed with other cognitive tests. It is the ability to think in various dimensions and to organize thoughts on the basis of mental pictures. Main areas of application: performance-related aptitude diagnostics, clinical psychology, neuropsychology, traffic psychology, aviation psychology, industrial and organizational psychology, as well as decisions in school, studies and career. A given figure has to be completed. The starting point is a bar which has differently shaped breaches for each task. Beneath 16 segments are shown which also are differently shaped. The task for each item is to pick one, two or three segments out of the 16 that will complete the bar. The test has 22 items. For the first 8 items only one segment is needed to complete the bar, for the next 8 two segments are needed, and for the last 6 three parts are needed. The split-half reliability coefficients vary between r =0.84 and 0.86 for respondents with different educational levels. The face validity is evident - the respondents think immediately of "perception of forms" and "laying a jigsaw puzzle". The logical validity is given by the operational definition of the measurement content. Content validity has been proven through analyses of correlations. The content of 2D is similar to the content of other spatial ability tests, which have good predictive validity for a variety of occupations. Thus, predictive validity can be ascribed to the 2D as well. Standardization was performed on a representative sample of normal persons (N=255) which was collected at the Schuhfried Company's research lab in 2004. These norms are available separately by gender, age and educational level. Norms for a sample of 547 Swedish working adults are available as well. Subdivisions according to educational level and age are included. The testing time is 6 minutes. Add approximately three minutes for instructions and solving the practice items.